Most people know that olive oil is mainly made in the Mediterranean region of the world, but many don’t realize that Spain is actually the largest producer, consistently making about 45% of the world’s olive oil in any given year – nearly half, and in some years more than half! Typically, Italy and Greece are the next two largest producing countries. 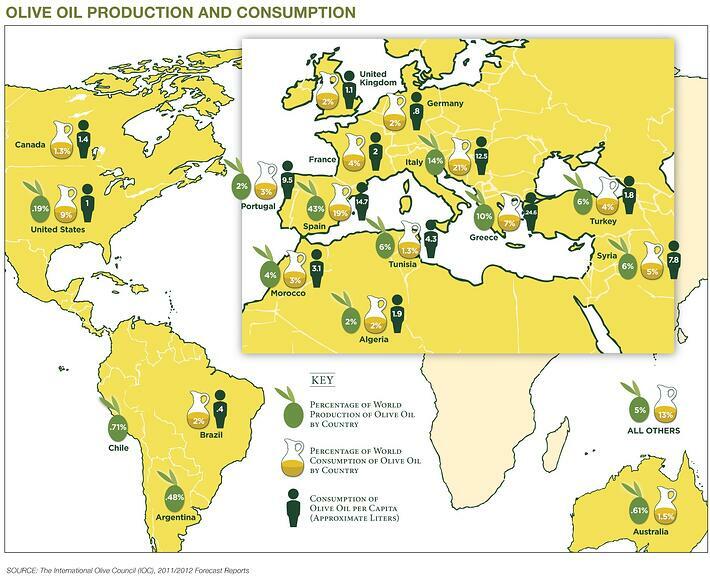 Although the bulk of production is still centered in the Mediterranean, consumption is growing all over the world. The United States is the largest volume importer of olive oil globally, accounting for about 35 to 40% of world imports annually. However, both Spain and Italy consume more olive oil in total than the U.S. and the U.S. lags significantly when it comes to consumption per capita. On an individual basis, Greeks are the biggest consumers of olive oil, using about 20 liters or 5.3 gallons per person annually! Other high-consuming populations include Spaniards with about 13 liters or 3.4 gallons per capita, and Italians with about 11 liters or 2.9 gallons per capita. By contrast, American per capita consumption is only about 1 liter/1 quart per person and Canadian per capita consumption is about 1.3 liters/1.4 quarts – meaning there is a lot of opportunity to replace less-healthy options with olive oil! Remember, you can substitute olive oil for nearly any other oil in recipes. 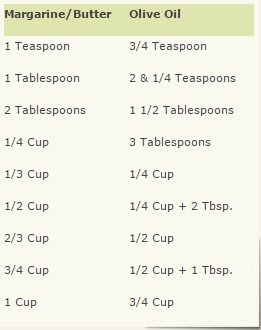 If a recipe calls for a tablespoon or a cup of vegetable oil, just use a tablespoon or a cup of olive oil instead. When you want flavor, use extra virgin olive oil, and to avoid affecting the flavor you can use regular olive oil. You can even replace butter with olive oil in many recipes, especially those that require melted butter. Just use 25% less olive oil than butter – our handy conversion chart is here.